All the vets at VLAC have extensive dentistry training in floatation and at our facility our specialists can performing advanced dental procedures that include oral surgery. Their veterinary education is at the forefront of equine dentistry research, technology, and practice. Our knowledge of dental anatomy, physiology, pathology, and diagnostics results in our ability to perform the highest standard of dental procedures, tailored specifically to each horse we evaluate and float. Our dentistry knowledge allows us to perform complete evaluations of your horse’s dental structures and surrounding soft tissue. Prior to even opening your horse’s mouth we examine the muscles and boney structures of your horse’s head and jaw as well as the temporomandibular joint. -Facial asymmetry, muscle atrophy, or bone abnormalities can indicate dental, nerve, or other problems. The palpation of the oral structures and evaluation with a mirror or dental camera can reveal ulceration on the tongue or cheeks. Additionally, we look for packing of food material between teeth, broken teeth, gingivitis, periodontal disease, and many other different kinds of dental pathologies. -These dental examinations allow us to customize your horse’s dental care specific to its individual needs. Often, in order to provide the best quality of dental care, we need to sedate your horse. At VLAC, before we start the dental procedure, we perform an abbreviated physical examination to determine a proper sedation protocol for the horse. Our use of mild and reduced amounts of sedation facilitates our thorough dental examinations and procedures. Additionally, sedation has mild pain relieving properties. When most appropriate for your horse, we use a dental speculum. Speculum use allows us to perform our in-depth examinations and allows us to visualize each dental arcade and tooth as we perform the dental floatation. 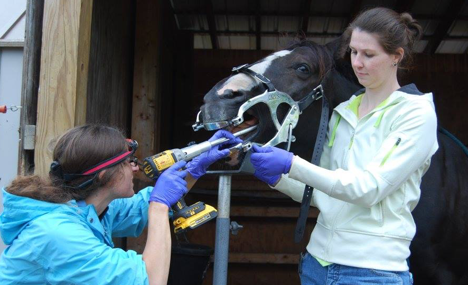 Furthermore, as equine dentistry involves the grinding down of tooth surfaces, sedation and the use of a speculum can reduce your horse’s anxiety, improve their comfort during the procedure, and result in safe horse handling. This allows us to perform proper floatation in a minimal amount of time, producing a positive experience for your horse. Power floating was first introduced to equine veterinary dentistry approximately 20 years ago, and recent advancements in the technique and technology have resulted in power floating becoming the one of the ways to perform quality equine dentistry. Power floating is performed on lightly sedated horses with an oral speculum to allow for visualization of the procedure. Proper power floating technique is minimally jarring to your horse’s jaw and allows for delicate and precise reduction in the dental abnormalities that are present. However, power floating may not be appropriate for all horses or all dental conditions, therefore you will see the veterinarians at VLAC use hand floats during our dental procedures. Power floating and hand floating can be used interchangeably and are equally efficacious when performed by a skilled practioner. It is our knowledge and ability to use a wide array of dental instruments that results in our best dentistry care for your horses. The veterinarians at VLAC truly enjoy equine dentistry and we work hard to further our dentistry knowledge and skills by attending specialized continuing education courses. We don’t just like dentistry, we love it!